I’m finally posting my tutorial on the rest of Goody‘s tools from its Simple Styles Collection. Remember my first tutorial on Goody’s spin pins here? 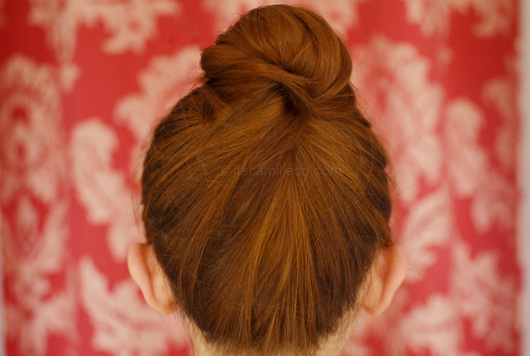 Even though I really love spin pins, there are other ways to achieve that perfect bun. How? Read on! First up, Goody’s modern updo pin. Step 1: Gather your hair. Step 2: Twist your hair into a bun. It doesnâ€™t have to be extremely neat. Step 3: Insert your modern updo pin from the base of your bun. Make sure the convex part of the pin is nearest to your scalp or simply put, the curve should be facing outward or away from your head. Step 4: Lift the modern updo pin upwards as you insert it through your bun. So now, the curved part of the pin is slowly facing inward. Step 5: Press pin downwards, making sure the curve of the pin follows the contour of your scalp. Voila! I really love this tool because it’s the easiest tool you can use to achieve a super high bun. 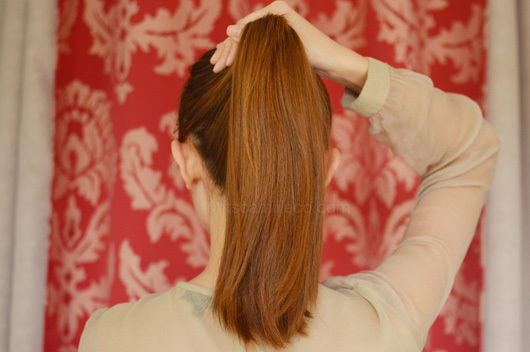 If you want your bun lower, you can do so too by gathering your hair (step 1) lower or at the base of your scalp. The modern updo pin also spreads your hair a little wider so it creates a bigger bun than that of the spin pin’s. Perfect for people with fine or thin hair like me! If you’re planning to get yourself a modern updo pin, there’s also a helpful how-to that comes with it so you’ll surely get the hang of it in no time! Actually, all of Goody’s Simple Styles collection come with helpful instructions. Next up–how to use Goody’s bun spiral pin. This round thing I’m holding is the bun spiral pin. Just so you know, I didn’t curl my hair here. My hair turned out this way after removing the modern updo pin. Step 3: Insert the bun spiral pin into your bun. Make sure the purple tips go in first. Step 4: Twist your bun spiral pin clockwise. This secures your bun while spreading your bun out too to create that messy top knot or classic ballerina bun, whichever you prefer. Tadaaaaaa! Again, the bun spiral also creates a bigger bun as compared to that of the spin pin’s. Anyway, I hope you enjoyed my quick tutorial! So if you’re having difficulty finding spin pins at a store near you, have no fear! You can use other Goody tools too! LOL! I don’t get it. What do you mean? This was very helpful. I’ve been struggling with my modern updo pin. Your are such a lovely young woman! Thank you. Hi Camille :) where can I buy these?